I recently restocked my supplement supply from my #1 favourite online bargain vitamin store ZipVit.co.uk. They've got some great deals on at the moment, including a year's supply of Omega 3, 6 & 9 for just £8.99!! Plus, if you spend over £25 you qualify for one or more of their fab free gifts. One which is a Yoghurt Covered Banana & Blueberry flavour protein bar from their great new sports range. I'm always a bit reluctant to try new protein bars, mostly because I get on so well with the Maximuscle Promax Diet bar range and I don't feel that I need anything else, but also because my experience with 'fruit' protein bars hasn't exactly been a favourable one... quite a few are revolting - like the gross Boots chocolate and strawberry protein bar that I was unlucky enough to purchase recently and be unable to finish! This is why I only ordered one of these bars instead of a whole box! I needn't have worried though. After all, I really enjoyed their chocolate and orange protein bar which I got free earlier this year when ZipVit were giving away their 'Formulated For Success' free sample boxes packed full of superb energy and recovery products to celebrate their affiliation with the Cevelo cycle team (in fact I think you can *still* get these boxes for free if you visit the success site: http://www.zipvit.com/success/!!). Be warned though, if you *don't* have a sweet tooth you won't like this very much but I'm quite impressed, especially as it reminds me of my favourite sweet low cal (although low protein too!) 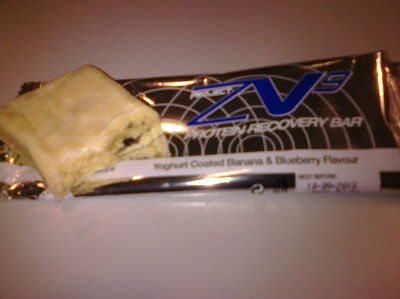 snack which is a Boots Shapers Blueberry and Yoghurt Nougat Bar. It's just under 90 cals so a great sweet-tooth-placater. This bar however is banana flavour (perhaps not to everyone's liking but I've grown to love it thanks to Maximuscle Promax Diet in Banana flavour!! ), has more cals (246) but also has 20.2g of protein! Obviously there's more in the way of carbohydrates for any of you low-carbers out there but then it's a bar, so it has to have bulk! But great in the way of PWO protein if you don't have a shaker or RTD like Maxi-milk handy!! Those Boots bars sound nice for "sweet tooth attack" moments (I have quite a few of them). My local branch seems to have brought in a few more food items so I must have a look and see if they are stocking them.